‘As an example to others and to spur reform in Australia, the Catholic Archdiocese of Sydney announced in March that it would slavery-proof its supply chains. 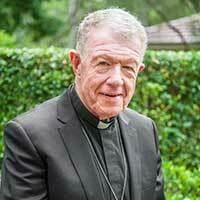 Bishop Brady called for a Modern Slavery Act that would include an Anti-Slavery Commissioner and require all large organisations operating in or doing business in Australia to provide an annual public statement on steps they are taking to eradicate slavery from their organisation and supply chains. This should apply not just to businesses, but also to governments and not-for-profit organisations. ‘The Australian Parliament has an important role ensuring governments commit to eradicate human trafficking and modern slavery from their supply lines,’ Bishop Brady said. ‘Australia adopted the goal of eradicating modern slavery, human trafficking and forced labour by 2030 as a participant in the unanimous General Assembly vote for the United Nations’ Sustainable Development Goals on 25 September 2015.